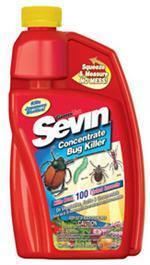 Sevin Insecticide Concentrate RTS is a ready-to-spray bug killer for eradicating more than 100 insects on vegetables, fruits, and ornamentals. Seven Concentrate is for outdoor residential use. Vegetable Insects Controlled: Alfalfa Caterpillar, Armyworm, Aster Leafhopper, Bean Leaf Beetle, Colorado Potato Beetle, Cucumber Beetles, Cutworms, European Corn Borer, Fall Armyworm, Flea Beetles, Green Cloverworm, Harlequin Bug, Imported Cabbage Worm, Japanese Beetle, Lace Bugs, Leafhoppers, Melonworm, Mexican Bean Beetle, Rednecked Peanutworm, Spittlebugs, Squash Bugs, Sweet Potato Weevil, Three Cornered Alfalfa Hopper, Thrips, Tomato Hornworm, Tomato Pinworm, Tortoise Beetles, Western Bean Cutworm, & many more. Ornamental Pests Controlled:Ticks, Ants (except pharaoh, harvester and carpenter ants), Azalea Leafminer, Blister Beetle, Brown Tail Moth, Elm Leaf Aphid, Eriophyid Mites, Fall Armyworm, Fuller Rose Beetle, Plant Bugs, Scale Insects, Tent Caterpillars, & many more listed inside. Would you like to see the Sevin Concentrate RTS Label? How about the Sevin Concentrate RTS MSDS sheet?